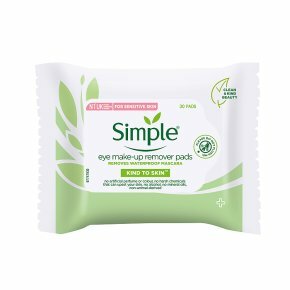 Simple Kind To Eyes Eye Make-Up Remover pads contain the perfect blend of cleansing goodness to help to gently remove even waterproof mascara. This Simple eye make up remover hydrates the delicate eye area. Made with the perfect blend of gentle cleansers, multi-vitamins and skin loving ingredients. Suitable for sensitive eyes and contact lens wearers - a great eye make up remover and mascara remover! Contains no artificial perfume or colour and no harsh chemicals that can upset your skin, suitable for all skin types, even the most sensitive skin. Non-comedogenic, hypoallergenic, dermatologically tested and approved.Our Kind to Skin Make-Up Removing Eye Pads effectively cleanses your eyes of make-up (including waterproof mascara) and impurities whilst instantly hydrating the skin around your eyes ? making them perfect for sensitive, dehydrated or dry skin. Cleansing plays an important part in a healthy skincare regime. However some eye make-up removers are harsh and can strip away natural oils, making the skin around your eyes feel tight, dry and dehydrated. Simple Kind to Skin Make-Up Removing Eye Pads are infused with skin-essential minerals and a plant extract and do not contain harsh chemicals, artificial colours or perfume, making them perfectly suitable for dehydrated, dry or sensitive skin. Simple Kind to Skin Eye Make-Up Removing Eye Pads are part of the Simple Kind to Skin range and are specifically designed to leave skin revitalised, supple and dewy fresh. Why not try out our other products in the Simple Kind to Skin range to help keep your skin hydrated? After using with Simple Kind to Skin Eye Pads, we recommend cleansing your face with Simple Kind to Skin Micellar Cleansing Water. Finish your routine by smoothing Simple Hydrating Gel Cream into your face and neck to instantly moisturise your skin and complete your hydration skincare routine. Cleansing plays an important part in a healthy skincare regime. However some eye- make-up removers are harsh and can strip away natural oils, making the skin around your eyes feel tight, dry and dehydrated. Simple Kind to Skin Eye Pads are infused with skin-essential minerals and a plant extract and do not contain harsh chemicals, artificial colours or perfume, making them perfectly suitable for dehydrated, dry or sensitive skin. Simple Kind to Skin Eye Pads are specifically dedicated to ensure your skin stays supple and dewy fresh after use. Why not try out our other products in the Simple Kind to Skin range to help keep your skin hydrated? After using with Simple Kind to Skin Eye Pads, we recommend cleansing your face with Simple Kind to Skin Micellar Cleansing Water. Finish your routine by smoothing Simple Hydrating Gel Cream into your face and neck to instantly moisturise your skin and complete your hydration skincare routine. Make sure to also try our Kind to Skin Eye Roll On, Eye Cream and Dual Effect Eye Make Up Remover and eye balm!